This time the MUCCrakers "dat" team (as opposed to the "dis" team) came home with a trophy. Now all we need is some clubrooms to display it in. 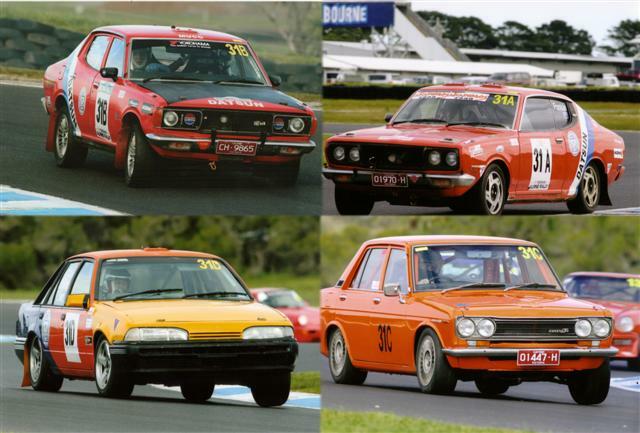 Well done Graham Pate (Datsun 180B), Peter Otzen (180B), Cale Pearce (Datsun 1600) & Matt Swan (Holden Berlina). In-car youtube video coming.... eventually! VICTORIAN RALLY CHAMPIONSHIP RETURNS TO ALEXANDRA. The Fourth round of the 2010 Victorian Rally Championship will be starting at 9:00 am in Perkins St. ALEXANDRA on OCTOBER 17th 2010 when the AKADEMOS rally comes to the area. Organised by the Melbourne University Car Club Inc, the Akademos Rally first ran in 1960, and was a continuous fixture on the Victorian Rally Calendar until 1993. This year sees the seventh local appearance of this famous rally. The actual competition will take place in the Rubicon Forest area South of THORNTON, with forest roads in the area specially closed for the day. Cars will assemble in Perkins Street from 8:00 am prior to the start. The cream of rally competitors from around Victoria will be taking part over about 100 km of forest stages, with several Australian Championship cars having a run as well. Best placed is Nathan Reeves in his Subaru WRX. Nathan currently leads the 2010 Victorian Championship but is being challenged by Jesse Robison, also in a Subaru. Warren Lee is also keen to get on the podium in his Evo 8 Lancer, having won a round of the championship earlier in the year. Also returning will be local Marysville Ski Hire proprietor Derek Reynolds in his Mitsubishi Lancer (below). The paint is still wet on the Lancer after it swapped ends and landed in the trees at Round 2 at Eden in NSW earlier in the year. The two wheel drive competition will be fierce with Alan Friend and Brian Semmens in a tight battle for the trophy all year. At the last round, hosted by RMIT Car Club, Alan and Brians respective Nissan 200SX's were separately by only 1 second after 80km of competitve stages.... you can't get much closer than that! On Sunday from 10:45 am, cars can be seen on Royston River Road, at the Browns Road junction, or at 11:10 on Blue Range Road, at the junction with Gravel Pit Road. In the afternoon, from 2:00 pm, and 2:25 pm respectively they return to both locations. Servicing of the vehicles will be held at the Thornton Sports oval on the Sunday about midday, and cars can also be seen in competition in the forest. Competitors will begin to return to the Alexandra Racecourse from about 3:30 pm on the Sunday afternoon. Spectator guides will be available on the morning of Sunday October 17th, in Perkins St Alexandra, adjacent to the Shire Offices, and also from the Oval at Thornton, or, you can download one right now! During the day, a number of forest roads will be closed to traffic to allow the rally to take place. These include, Blue Range Road, Quartz Creek Road, Royston River Road ?south from Browns Road, Browns Road/No 5 Track, Snobs Link Road and the Eildon/Warburton Road North Snobs Link Road. 2002/45 Haig St. SOUTHBANK 3006. MUCC Inc is having a 55th birthday celebration on Wednesaday 25 August. The venue is Sketches at 272 Burwood Highway Burwood starting at 7:00 PM. The cost will be $20 per head with the Club subsidising the balance. To enable the serving of courses to be done simultaneously (almost) a selection of three or four options will be offered for 3 courses from the normal menu and these will be posted in the next few days for pre-ordering. The normal menu is available at www.sketchescafebar.com.au. Wine is BYO or alcohol can be purchased at the restaurant as required. Food and coffee/tea is included in the $20 cost. We had a monthly dinner at Sketches last year and the food was very good. Acceptances in the order of receipt. With the Civic still out of action following my discovery of the limitations of ?off the shelf? head gaskets at last year?s 6 Hour Relay at Phillip Island, I saw 11 July as simply an opportunity to take my new daily driver Outback for a run up to DECA to perform scrutiny then watch the proceedings and help with timing. That changed with an offer from Darren McKemmish to share his Fraser Clubman (a contra deal for his use of my trailer), so I added my driving suit and helmet to the gear in the car and headed off early on Sunday morning for the drive up to Shepparton. Have you heard about CARnival? No, it's not in Rio, it's in Echuca-Moama! A 4 day festival of motorkhanas, rally sprints, tarmac stages at the airport and a whole heap of other activities. Organised by the gurus who are usually responsible for ripper events such as the Red Centre to Gold Coast Trial, Bega Valley Ralley and host of other "big" events, these guys are sure to put on a good looong weekend. This event should be a real hoot. The MAXIMUM entry fee is $195, and that allows you to enter EVERY event your car is eligible in, or you can just enter the events of your choice. Plenty of info is available on the event website.